That means that you don’t have to blow out your sprinklers, prep the lawn for aeration, put down winterization fertilizer along with weed killer to prep for the spring. It also means that you will be able to enjoy a plush green artificial grass lawn all year round. As we all know in Denver Colorado our grass goes dormant and turns brown in the winter, but with our low maintenance Pro green artificial grass that will no longer happen. When winter hits, and its snows and eventually melts away you still have a green lawn. Plus, when you start heading into spring, there is very little you need to do with your artificial grass lawn. Artificial Grass Putting Green: Do you play golf in the winter? 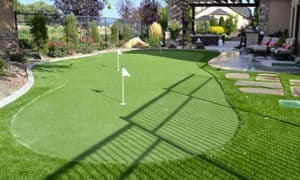 When you add in artificial turf putting green to your yard, you will be able to practice your game all year round by just walking outside to your backyard. All your friends will wonder why your game is still so good, and you will just laugh knowing that it’s because of that putting green that you added to practice on. 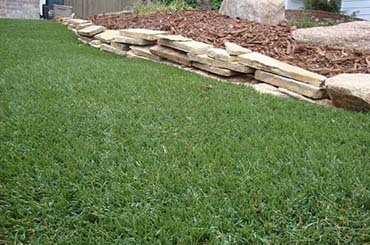 When you choose us, we install Pro green Proflow Turf Technology that has 100% drainage with no perforated holes. There is no other artificial grass out there that does this. The Proflow backing is comprised of two heavy gauge woven layers, one five pick layer and a final coating of a high-viscosity polyurethane compound. Before they apply the compound the turf, they inject it with air that creates passages that allow for free flow drainage. ProFlow provides a percolation rate that stays consistent throughout the life of your turf system. ProGreen has been producing and installing synthetic grass from start to finish in their own facilities in the USA for 30 years. We chose to be a dealer for them because of it’s high quality, durability and reliability for our customers to use year round.